I was surprised when they opened class in prayer. I had flown out to LA to interview for a job at Biola University, and the public display of piety took me off guard a bit. It shouldn’t have. Prayer and theological study belong together. Some of the earliest theological reflection erupted in prayer and praise. Paul forgets himself in doxology in the midst of writing letters, and theologians through the ages have fallen into the same blessed rut. But a couple centuries have conspired to make prayer in a theology class dubious, or at least weird. Leave it to church, to private devotion. Class is for critical engagement; it’s where the scientific work of investigation occurs. This modern anxiety that lived experience will taint inquiry too often leaves theologians suspicious of those who pray and those who pray suspicious of theologians. In the last couple of decades, the tide has been turning. Signs of a change go back to Barth, who’s insisting that the theologian (and her students) is, willy-nilly, thrown into the thick of things from the outset—being addressed by the Word of God and being responsible to speak in turn. The worst thing one can do is speak about God without ever bothering to speak to God, and Barth castigated the friends of Job for their third-person theologizing, which is no theologizing at all. To do the work of theology, then—to read it, write it, talk about it—is to find oneself praying. And to pray, like it or not, is to theologize. 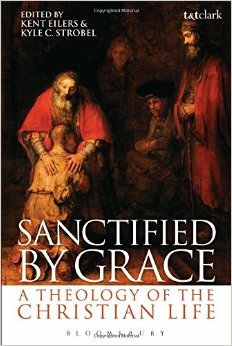 In one sense, the whole book’s about sanctification, about the growth in holiness culminating in perfect, eternal fellowship with the triune God and his people. But it’s much more comprehensive than that,covering all the major doctrinal loci (except, funnily enough, the last things, with Chris Holmes’ chapter on the perfecting God less interested in a considering of final perfection in the eschaton). I’m reminded of Jürgen Moltmann’s first three books, in which he sought to examine all of theology through a particular lens (cross, resurrection hope, Trinity). This is a helpful way to think through the various doctrinal loci without trying to say everything, and the lens of sanctification is timely. The editors designed the book to be used in the classroom. I could easily see it serving as a good systematic theological text. The editors are to be commended for a wise organization of the material. From the table of contents alone, the reader knows that the Christian life is encompassed by the triune God of grace. It begins with the gracious one, includes the chief graces of life with him, then turns to the ordinary means of grace before concluding with the practices of grace. The essays are excellent. In almost every case, this is the person you want to write the essay. And yet, though the authors have proven themselves on their topics, these don’t read like boiler-plate essays. They are new, fresh, sometimes surprising, occasionally weird. You ask Will Willimon to write an essay on preaching, and he could do it in his sleep. He doesn’t, though. Instead, attentive to the prompt of the book, he writes a tiny biblical theology of speech, describing an “explosion of pushy, Easter-induced speeches into all the world.” “Easter,” he writes, “is the resumption, by God, of a conversation we, in our sin, attempted to end.” Then he turns to the sanctification God effects through sermons and an extended, though not exhaustive, account of “sanctifying disciplines required for faithful listening to sermons.” His is one of the best essays, as his account of preaching and hearing sermons is as theologically thick as it is practically attuned. I could imagine an entire Sunday school course in which congregants are taught and then begin to cultivate Willimon’s disciplines for listening. Other essays that I particularly enjoyed were Christiaan Mostert’s on redemption and victory, John Webster’s on mortification and vivification, Phil Ziegler’s on discipleship, and Ashley Cocksworth’s on prayer. I often found myself excited to read more, to follow up on Ziegler’s interest in Bonhoeffer, on Cocksworth’s work on prayer, on Tom Gregg’s forthcoming multi-volume ecclesiology. Even were a teacher dissatisfied with a particular essay (there were one or two that I didn’t love), he could easily supplement it with a different article. For example: Holmes’ chapter on the perfecting God was idiosyncratic. I was surprised that he would turn to Barth and an apocalyptic read of Galatians and not, say, Nyssen or Wesley or Thomas for an account of perfection; but in the classroom I could turn that into a fruitful discussion with students about how best to frame perfection. That’s my take. Wanna hear more? Check out the blog tour that T&T Clark is sponsoring for this excellent, enriching book.